Mr.Arudpiragasam says in the preface "this book is the result of a search for solutions to eradicate poverty, and to resolve humanitarian issues of inequality and human indignity through sustainable development. The realization of this objective calls for radical review of theories, notions and instruments that assert a growing influence on economic and social progress of societies." 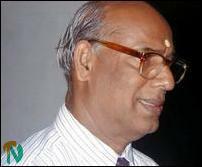 Professor Mohanadas said there are eight faculties in the Jaffna University and three of them deal with the teaching of finance and other related subjects. The book on "Monetary Exploitation" is useful not only to academics but also to students interested in the economics. With the collapse of Marxism, globalization leaves third world countries to be monetarily exploited, he said. "We now tread on a new path to achieve peace. But permanent peace cannot be achieved without freedom ensured in the sphere of socio-economy," said Professor Mohanadas. Mr.Arudpiragasam holds the post of the Director General of Global Sustainability Initiative based in Trincomalee. 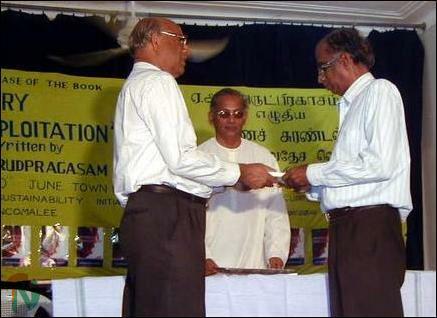 He has authored several books including "The Traditional Homeland of Tamils." 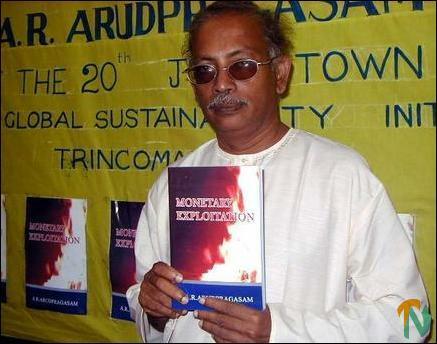 Author Mr.Arudpiragasam with his book on "Monetary Exploitation"